Acre (Ebreu: עַכּוֹ‬, Akko; Arabic: عكّا‎, ʻAkkā), is a ceety in the Wastren Galilee region o northren Israel at the northren extremity o Haifa Bay. Acre is ane o the auldest continuously inhabitit steids in the kintra. Historically, it wis a strategic coastal link tae the Levant. Acre is the holiest ceety o the Bahá'í Faith. In 2009, the population wis 46,300. 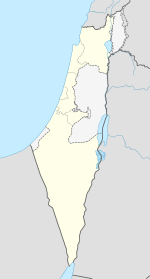 Acre is a mixed ceety, 72 percent Jewish an 28 percent Arab. Accordin tae the Israeli Central Office o Statistics, 95% o the residents in the Auld Ceety are Arab. Anerlie aboot 15 percent o the current Arab population in the ceety descends frae families who lived thare afore 1948. Schuils for Arab ceetizens hae been unnerfundit. In 1999, thare wur 22 schuils in Acre wi an enrollment o 15,000 childer. In 2000 thare wis anerlie ane Arab elementary schuil in the ceety. The Sir Charles Clore Jewish-Arab Community Center in the Wolfson neighborhuid runs youth clubs an programs for Jewish an Arab childer. In 1990, Mohammed Faheli, an Arab resident o Acre, foondit the Acre Jewish-Arab association, which oreeginally operatit oot o twa bomb shelters. In 1993, Dame Vivien Duffield o the Clore Foundation donatit funds for a new biggin. Amang the programs affered is Peace Child Israel, which employs theater an the airts tae teach coexistence. The pairticipants, Jews an Arabs, spend twa months studyin conflict resolution an then wirk thegither tae produce an oreeginal theatrical performance that addresses the issues thay hae explored. Anither program is Patriots o Acre, a community responsibility an youth tourism program that teaches childer tae acome ambassadors for thair ceety. In the simmer, the centre runs an Arab-Jewish simmer camp for 120 disadvantaged childer aged 5–11. Some 1,000 childer tak pairt in the Acre Center's youth club an youth programmin ivery week. Adult education programs hae been developed for Arab weemen interestit in completin thair heich schuil education an acquirin computer skills tae prepare for joinin the wirkforce. The centre an aa affers parentin courses, an muisic an dance classes. Acre's Auld Ceety haes been designatit bi UNESCO as a Warld Heritage Steid. Syne the 1990s, lairge-scale aircheological excavations hae been unnertaken an efforts are bein made tae preserve auncient steids. In 2009, renovations wur planned for Khan al-Omadan, the Inn o the Columns", the lairgest o several Ottoman inns still staundin in Acre. It wis biggit near the port at the end o the 18t century bi Ahmed Pasha al-Jazzar. Merchants who arrived at the port wad unload thair wares on the first floor an sleep in lodgins on the seicont floor. In 1906, a clocktouer wis addit ower the main entrance markin the 25t anniversary o the reign o the Turkis sultan, Abdul Hamid II. In 1750, Daher El-Omar, the ruler o Acre, utilized the remnants o the Crusader waws as a fundation for his waws. Twa gates wur set in the waw, the "land gate" in the eastren wall, an the "sea gate" in the soothren wall. The waws wur reinforced atween 1775 an 1799 bi Jezzar Pasha an survived Napoleon's siege. The waw wis thin: its height wis 10 tae 13 metres (33 tae 43 feet) an its thickness anerlie ane metre (3 ft). A hivy land defence waw wis biggit north an east tae the ceety in 1800–1814 bi Jezzar Pasha an his Jewish advisor Haim Farhi. It consists o a modren coonter airtillery fortification which includes a thick defensive wall, a dry moat, cannon ootposts an three burges (lairge defensive touers). Syne then, no major modifications hae taken place. The sea waw, which remains maistly complete, is the oreeginal El-Omar's waw that wis reinforced bi Jezzar Pasha. In 1910 twa additional gates wur set in the waws, ane in the northren waw an ane in the north-wastren corner o the ceety. In 1912 the Acre lichthoose wis biggit on the sooth-wastren corner o the waws. The Mosque o Jezzar Pasha wis biggit in 1781. Jezzar Pasha an his successor Suleiman Pasha, are baith buried in a sma graveyard adjacent tae the mosque. In a shrine on the seicont level o the mosque, a single hair frae the prophet Mohammed's beard is kept an shawn on special ceremonial occasions. The current biggin which constitutes the citadel o Acre is an Ottoman fortification, biggit on the fundation o the Hospitallerian citadel. The citadel wis pairt o the ceety's defensive formation, reinforcin the northren waw. Durin the 20t century the citadel wis uised mainly as a preeson an as the site for a gallows. Durin the Breetish mandate period, activists o Jewish Zionist resistance movements wur held preesoner thare; some wut executit thare. Built in 1795 bi Jezzar Pasha, Acre's hammam haes a series o het ruims an a hexagonal steam ruim wi a marble funtain. It wis uised bi the Irgun as a brig tae break intae the citadel's preeson. The bathhoose kept functionin till 1950. Unner the citadel an preeson o Acre, airchaeological excavations revealed a complex o haws, which wis biggit an uised bi the Hospitallers Knights. This complex wis a pairt o the Hospitallers' citadel, which wis combined in the northren waw o Acre. The complex includes sax semi-jynt haws, ane recently excavatit lairge haw, a dungeon, a dinin room an remains o an auncient Gothic kirk. Medieval European remains include the Kirk o Saunt George an adjacent hooses at the Genovese Square (cried Kikar ha-Genovezim or Kikar Genoa in Ebreu). Thare wur an aa residential quarters an mercatplaces run bi merchants frae Pisa an Amalfi in Crusader an medieval Acre. Thare are mony Bahá'í holy places in an aroond Acre. Thay oreeginate frae Bahá'u'lláh's impreesonment in the Citadel during Ottoman Rule. The feenal years o Bahá'u'lláh's life wur spent in the Mansion o Bahjí, juist ootside Acre, even tho he wis still formally a preesoner o the Ottoman Empire. Bahá'u'lláh dee'd on Mey 29, 1892 in Bahjí, an his shrine is the maist holy place for Bahá'ís — thair Qiblih, the location thay face when sayin thair daily prayers. It contains the remains o Bahá'u'lláh an is near the spot whaur he dee'd in the Mansion o Bahjí. Ither Bahá'í steids in Acre are the House of `Abbúd (whaur Bahá'u'lláh an his family residit) an the Hoose o `Abdu'lláh Páshá (whaur later 'Abdu'l-Bahá residit wi his family), an the Garden o Ridván whaur he spent the end o his life. In 2008, the Bahai holy places in Acre an Haifa wur addit tae the UNESCO Warld Heritage Leet. The Acre central bus station, served bi Egged, affers ceety an inter-ceety bus routes tae destinations aw ower Israel. The ceety is an aa served bi the Acre Railway Station. ↑ Jerry Stokes. Changing World Religions, Cults & Occult. Jerry Stokes. p. 410. GGKEY:7PKT22E2TP3. Retrieved 19 October 2010. ↑ "Table 3 – Population of Localities Numbering Above 2,000 Residents and Other Rural Population" (PDF). Israel Central Bureau of Statistics. 2009-12-31. Retrieved 2011-02-06. ↑ Stern, Yoav. "For Love of Acre". Haaretz. Retrieved 2008-10-20. ↑ "Archaeology in Israel – Acco (Acre)". Jewishmag.com. Archived frae the oreeginal on 6 June 2009. Retrieved May 5, 2009. ↑ "Baha'i Shrines Chosen as World Heritage sites". Baha'i World News Service. 2008-07-08. Retrieved 2008-10-20. ↑ Glass, Hannah (2008-07-10). "Israeli Baha'i Sites Recognized by UNESCO". Haaretz. Archived frae the oreeginal on 2008-09-22. Retrieved 2008-10-20. ↑ "Pisa – Official Sister Cities". © Comune di Pisa, Via degli Uffizi, 1 – 56100 Pisa centralino: +39 050 910111. Retrieved 2008-12-16. ↑ "La Rochelle: Twin towns". www.ville-larochelle.fr. Retrieved 2009-11-07. ↑ "Bielsko-Biała – Partner Cities". © 2008 Urzędu Miejskiego w Bielsku-Białej. Retrieved 2008-12-10. Karsh, Efraim (2010). Palestine Betrayed. Yale University Press. ISBN 978-0-300-12727-0. Wikimedia Commons haes media relatit tae Acre, Israel. Wikisource haes the text o the 1911 Encyclopædia Britannica airticle Acre (town). This page wis last eeditit on 26 Februar 2018, at 08:09.